A lifelong Tennessean, Jamie began writing fantasy stories and drawing comics as a hobby and later on for the school and local newspapers. After recieving various rejection letters from publishers, he put his interests on the backburner, pursuing a career in Video Production & Broadcast Media. On a whim, he submitted a portfolio to SCAD’s Sequential Arts program and was accepted. This gave him the boost to take his hobby seriously. 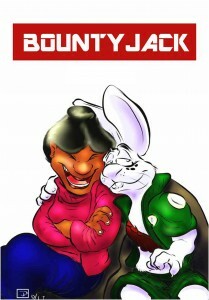 Bountyjack #2 is the second issue of his first graphic novel series, with #1 being published by KaBlam. He hopes to continue this series, as well as pursuing other graphic novels and fiction writing.